August 1, 2013 – 2013 marks the year of The Gathering, a celebration of all things Irish worldwide. 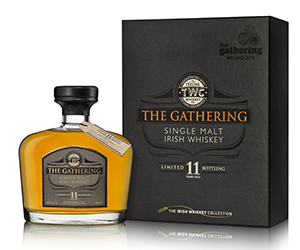 Teeling Whiskey Company has released The Gathering, a special 11-year-old single malt whiskey, at The Loop’s travel retail shops in Dublin and Cork airports to commemorate the event. Just 1,000 bottles will be available. The whiskey was matured for more than 11 years in ex-Bourbon casks, then bottled at 46% ASV with no chill-filtration. It is available starting today at a price of €69.95 ($92.50 USD) in the Irish Whiskey Collection shops at both airports. The Irish Whiskey Collection shops offer a range of whiskies from all of Ireland’s whiskey producers, along with exclusive bottlings like The Gathering. Travelers flying through either airport can pre-order in advance and pick up their whiskies on landing. To hear an interview with Jack Teeling on his family’s new company and heritage in Irish Whiskey, listen to Episode 429 of WhiskyCast.